Welcome to Day 3 of Soup Week! I'm sharing a different bowl of soup with you every day this week. Enjoy! This soup, a brilliantly creative twist on a classic, was the first recipe that caught my eye from my new Gourmet Today cookbook. The texture of this soup was perfect. I followed the instructions to puree only a cup of the soup, stir it back in, and leave the rest chunky. The curry flavor didn't come across quite as strongly as I'd like; next time I'll add a bit more. The other flavors played well together to make up for the lack of curry, though, and I loved, loved, loved the spinach. This soup was a big win, and I'll definitely be making it again this winter. 1. Heat butter in a large heavy saucepan over medium heat until the foam subsides. 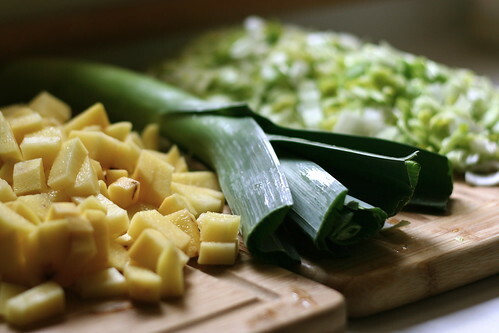 Add leeks, potatoes, curry powder, salt, and pepper and cook, stirring occasionally, until leeks are softened, about 5 minutes. Stir in water and stock, bring to a simmer, and simmer, uncovered, until potatoes are very tender, about 5 minutes. 2. 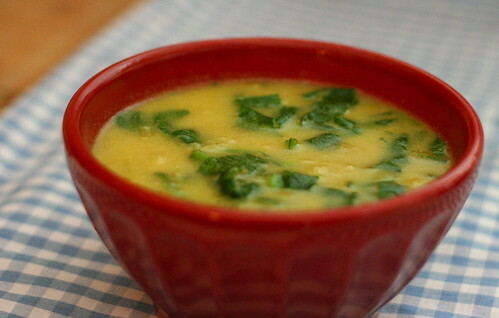 Transfer 1 cup of soup to a blender (use caution when blending hot liquids) and puree until smooth. Return puree to the pan, stir in milk, and bring to a simmer. Stir in spinach and simmer until spinach is wilted, about 1 minute more. Note: The soup, without the spinach, can be made up to 2 days ahead. Cool, uncovered, then refrigerate, covered. To serve, bring to a simmer, stir in spinach, and simmer until wilted, about 1 minute. I love potato in soup - It adds such a wonderful dimension! This sounds lovely, and the flavours are spot on =D. Ooh, this sounds fantastic! I'm a curry freak, too - always adding more than the recipe calls for. Oh wow, this looks amazing. I have a surplus of Yukon Golds in the fridge, so I'll be making this sooner rather than later. Yummm.